The challenges faced by autistic teens and young adults, including Caroline and Jay (above), are chronicled in HOW TO DANCE IN OHIO. Photo courtesy HBO. That poignant remark, heard during the opening moments of producer/director Alexandra Shiva’s new film, How To Dance in Ohio, pretty much sums up the hurdles facing youngsters on the autism spectrum. They are especially vulnerable as they transition from the safe cocoon of home and family to more independent lifestyles in college, careers and romantic relationships. 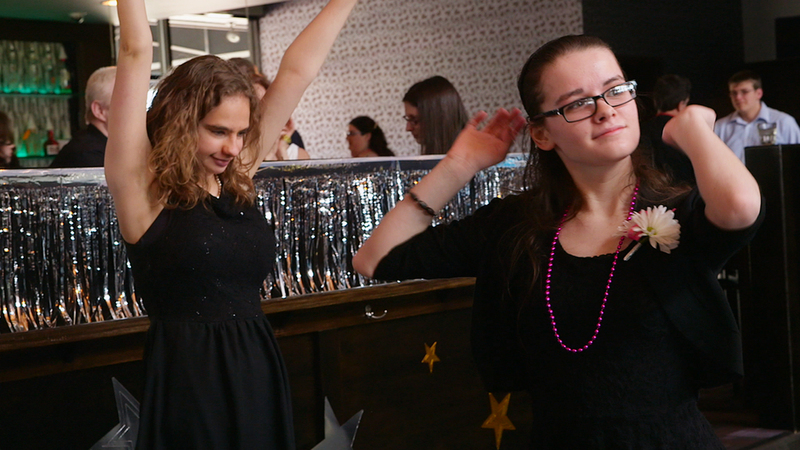 How To Dance In Ohio follows an engaging group of higher functioning autistic teens and young adults in Columbus, Ohio, as they prepare to attend their very first formal dance. For young people on the spectrum, “preparation” is a double-edged sword, as you will see if you tune in HBO tonight, Monday, October 26, 2015, 9:00 – 10:30 p.m. ET/PT (Check listings for additional playdates). Currently, one in 68 children in the U.S. has been diagnosed with autism, a “tenfold increase in the past decade.” That means most of us probably know at least one or more families raising a child on the spectrum. While there have been countless films, books and articles touting sanctioned and alternative programs and therapies specifically geared for autistic children, How To Dance in Ohio focuses instead on higher functioning autistic young adults who benefit immensely from ongoing social and life skills programs. Three young women–22-year-old Jessica; her best friend, 19-year-old college student Caroline; and 16-year-old high school student Marideth–are of special interest. They and their peers are patients of clinical psychologist Dr. Emilio Amigo, and his staff, at the Amigo Family Counseling Center in Columbus, Ohio. 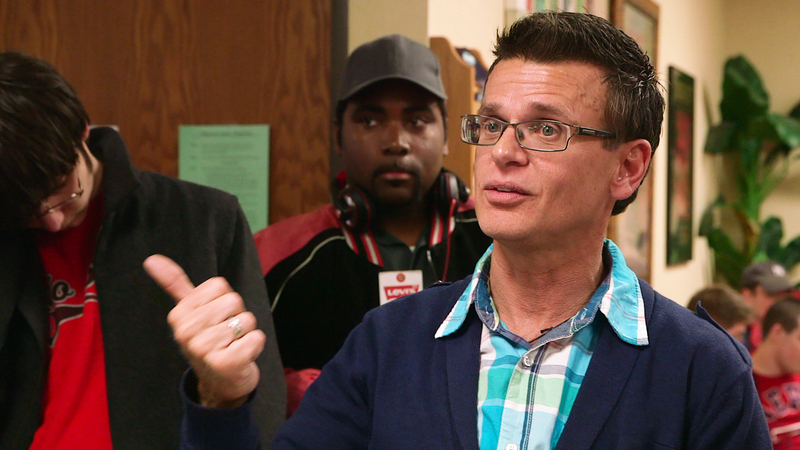 Dr. Emilio Amigo gently coaches his autistic patients to become sociable young adults in HOW TO DANCE IN OHIO. Photo courtesy HBO. The spring formal dance presents an especially difficult set of challenges, both physical and psychological. Anxiety levels run high, as Dr. Amigo and his staff gently address and build his patients’ confidence and skill level through repetitive practice group encounters. Although Dr. Amigo admits that the dance is a risky endeavor, he’s hopeful that his patients will go the distance. Jessica, Caroline and Marideth’s struggle to process the idea of attending the dance and interacting with young men as their dates is, at times, heart-wrenching. It’s clear during the young women’s intimate and sometimes exasperating day-to-day family encounters and group sessions that they are beset with crippling fears and repetitive avoidance tactics. Jessica still lives at home with her parents but works at a bakery that employs and trains autistic adults. She longs to live independently in her own apartment. Jessica Sullivan and Caroline McKenzie shop for the perfect gowns for their spring formal dance. Photo courtesy HBO. Caroline overcame a rocky start at a community college and has a crush on a boy she met in Dr. Amigo’s therapy group. With hours spent researching data on her computer, Marideth has the hardest time engaging with others. Yet, according to her mother, Marideth was incapable of even being touched just 10 years before. The promise for change and growth is evident. Jessica and Caroline eventually enjoy the spotlight as they joyfully shop for formal evening gowns and walk the red carpet to the dance. And Marideth plays a sly waiting game until she receives an invitation from the boy who secretly interests her. Ultimately, the young women work through their social and physical discomfort to shine on the dance floor. This is no small feat, but is accomplished thanks to their supportive parents and the life skills learned from the man who orchestrated the dance project to begin with. His surname, Amigo, couldn’t be more fitting. Marideth, foreground, hits the dance floor in HOW TO DANCE IN OHIO. Photo courtesy HBO. How To Dance in Ohio is a compassionate, eye-opening introduction to young people facing adulthood on the autism spectrum. “We’re all different… like multi-colored M&M’s,” says one of Dr. Amigo’s patients. That’s an assessment that could fit us all, let’s face it…no matter what “spectrum” we find ourselves assigned to. This entry was posted in Cable, Film and tagged Adolescence, Alexandra Shiva, Autism Spectrum, Dance Therapy, Developmental Disorders, Dr. Emilio Amigo, HBO, How To Dance in Ohio, Psychology. Bookmark the permalink.